7th at the IFBB Australian Pro G.P.! The D-day was here and I gave all I had on stage and when the dust settled I came in 7th out of 15. It was my best ever placing in a pro show thus far and what made me more pleased and was the field was a very tough one. Kai Greene, Dexter, Melvin, and the new comer Roelley from Holland all came in very good shape. I just missed the top 6 finalists by a mere 4 points! 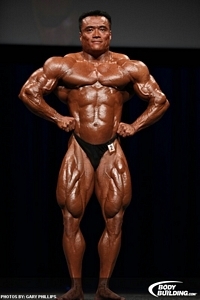 I was called for the second call-out and was compared with Melvin and Roelley and a few more bodybuilders. The judges really made us worked like hell on stage. I was compared 4 times in a row and Thank God i did my homework in posing before i left for Melb otherwise i would have been in deep deep trouble! Overall I am glad that i came in the best shape of my life at the Oz show. A great achievement for me indeed as I took almost 3 years break. So now I am looking forward to the New York Pro on the 8th May and will come in even better. Cant wait for that. I am already back to the gym 2 days after the Oz. Body rebounded superbly and I am taking this opportunity to bring my physique to the next level as this period (4 weeks or so after a contest ) is the best and easiest time to GROW GROW GROW! I will be keeping you guys posted about my next contest. More contest pix for the Oz show will be posted on the gallery page very soon. Stay tuned.